Update: I want to share some good news with you. Last week, my new book Real Artists Don’t Starve debuted on the Wall Street Journal Best Sellers list at #6. Thank you for the support! The best is yet to come. Since releasing Real Artists Don’t Starve, I’ve heard from a number of people who don’t believe it’s possible to make a living off your creativity — whether in writing, fine art, or another medium. But is that really true? Do this while you’re young. Always have something to fall back on. When I was growing up, I was told that creativity, though a nice outlet, was never something you should go “all in” on. Because, odds are, you’ll starve. You may have been told the same. It turns out, though, that’s just not true. For years, the Strategic National Arts Alumni Project (SNAAP) has been surveying graduates of arts programs to see how successful they are in the real world. Approximately 120,000 degrees in the arts are awarded every year, and the question is, what happens to these people? Not what you think. You might imagine, as I did, the stereotypical starving artist: the stubborn loner struggling to make ends meet and forsaking every adult concern for their work. This is what we have been taught to expect when imagining people in full-time, creative careers. We imagine poverty-stricken souls spending their days slaving away at the work, toiling in agony to create their next masterpiece. We picture Michelangelo on his back, nose to ceiling, paint dripping in his eyes, earning little for his genius. They report income levels that support families, sustain careers, and enable charitable giving. In other words, they are not starving. Contrast that with a 2014 US Census Bureau where nearly 75 percent of science, tech, engineering, and mathematics graduates are not employed in their field of study, and we are forced to consider a new reality for modern creatives. Many artists are, in fact, not suffering for their craft. They’re proudly producing work that matters and pays the bills. You can make art and make a living. They don’t believe they have to suffer to succeed. These people, those I call Thriving Artists, think about themselves and their work differently than those who don’t succeed. Discarding the ways of the Starving Artist, they follow a new set of rules, what I call The Rules of the New Renaissance. These are the things nobody told me — as a kid drawing cartoons, a teenager playing the guitar, and a twenty-something dreaming of writing books. In my new book, I share story after story of thriving artists who didn’t suffer for their work but instead found a way to live off it. And if we follow in their footsteps, adopting the rules by which they live their lives, we can do the same. 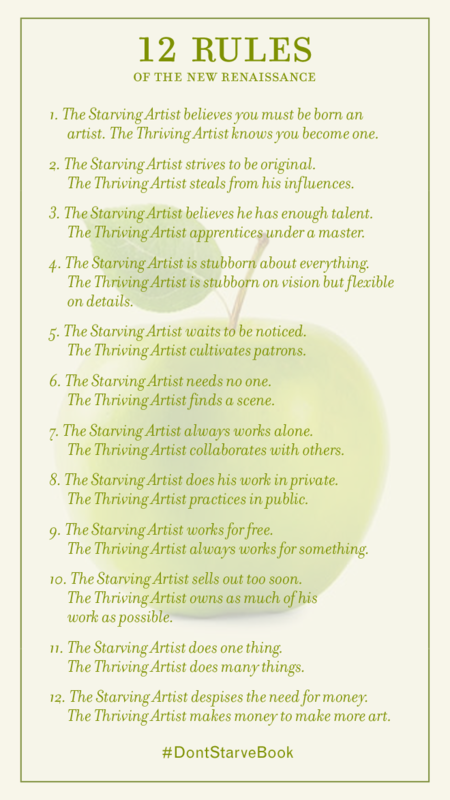 To learn more about how you can stop starving and join the New Renaissance, check out Real Artists Don’t Starve. Order the book and get over $100 in bonus resources. Click here to download the full-size infographic with the 12 Rules of the New Renaissance. You can also check out Real Artists Don’t Starve here. Are you working in your field of study? 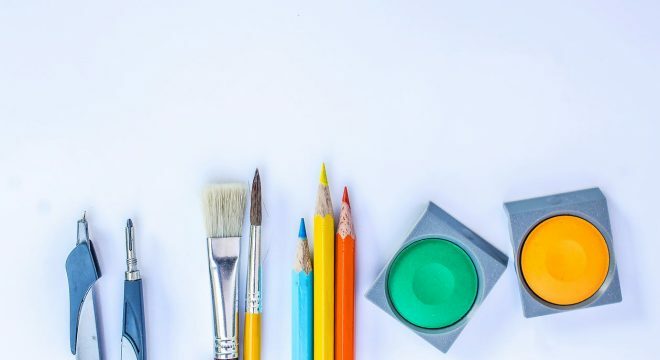 How can you leverage creativity for your advantage at work? Share in the comments. I was told exactly the same thing when I was young… art isn’t a real career. So I turned down the art scholarship and sought a degree in business. Today, I am a business professional but my passion is writing. I realized about 7 years ago, the first thing I think about in the morning is how to tell my story. I’m so glad I have been doing that ever since. I am devouring Real Artists Don’t Starve. Thank you for writing it. To me, this is a key point for living our lives, no matter what we are doing (by choice or to get by). Diversity means you are creative. You have different perspectives. Opportunities are pursued. When we do many things we are more fulfilled. Thanks for the book and these reminders Jeff. Indeed! Thanks for sharing, Virginia! The other day I made $200 for an hour of consulting with a client. A few minutes ago I made $35 for 10 minute’s worth of work. My eBooks, audio books and paperbacks sell passively every day. But I recall the lean days, when I clung to many starving artist limiting beliefs around money, and to manifest even $10 was the biggest struggle and nightmare for me. What was the difference maker? I began to slowly and painfully let go silly limiting beliefs around money I had rented from fam, friends, public and yes, starving artists. 4 words: It Is Just Money. No big deal. Just a medium of exchange. Hundreds of thousands of years ago, sheep and seashells were common mediums of exchange. If someone handed you a seashell in appreciation of your work, would you deem the seashell evil, or filthy, or tainted? Then why do so with money? It is JUST money. A way to receive something that we non-detached, worldly folks tend to use to eat, to find shelter, to help others with, and to buy neat stuff with. Thanks, Ryan. But I did not hit the NYT list. It hit the WSJ list. Just wanted to clarify. Good word on “it is just money.” Thanks for sharing! Great thoughts Jeff. Thanks for sharing. The poster is amazing. I teach graphic design and in the UK, the creative industries are worth £84 billion to the UK economy every year. I fully believe you can make a living from your creative talents! I haven’t made much money as yet with my writing, but with a new mind set and your book I am working to turn this around. Thank you, Jeff. Many people can be quite condescending when I tell them that I did an Arts and Communication degree even though it was my choice and got way above the required marks to be accepted. Now I am taking that creative degree and turning it into a freelance career. To be honest, it has been quite difficult but I am determined to make it work and not starve! It’s Wonderful Jeff. The way you described about the art and the art hidden inside one person. It’s marvelous, I always believe in this kind of thoughts. This is my Online Shopping Website named as locoshop. very nice information jeff and cousin is the fine art worker i think it will help him to make money.